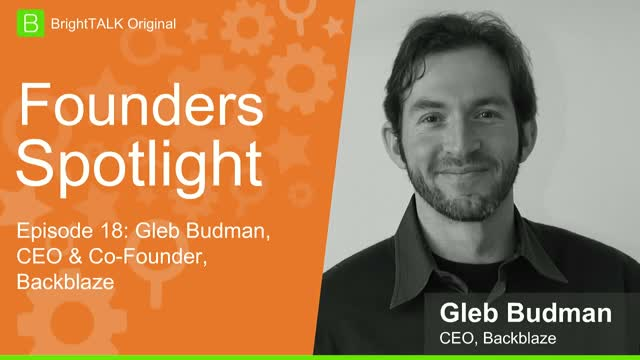 This webinar is part of BrightTALK's Founders Spotlight Series, where each month we feature inspiring founders and entrepreneurs from across industries. In this episode, Gleb Budman, CEO and Co-Founder of Backblaze, will share his behind-the-scenes insight into what it's really like to found a tech startup. Backblaze delivers astonishingly easy and low-cost cloud storage and cloud backup services. They currently store over 600 petabytes of data for customers in over 150 countries and have won a spot on Deloitte's Fast 500 list three consecutive years. Gleb is founder of three companies, leader in two startups from pre-launch through acquisition, and a seasoned executive. He is on a mission to make storing data astonishingly easy and low-cost. Is your content stuck on a dying archive platform? You may see the signs coming: the vendor increases support charges, product enhancements slow down and marketing ceases. Once the rumors start, it won’t be long before the vendor announces end-of-life plans. If decades of your content are archived in a closed-format, proprietary platform you’ll need to migrate immediately, before it’s too late. Is your MAM holding you back? With so many new ways to monetize content, keeping your assets organized and accessible is more important now than ever. Switching to a more intelligent MAM can simplify content reuse, improve collaboration, and give your business a competitive advantage as markets evolve and new opportunities emerge. Join us as we introduce the new and updated features of Backblaze Cloud Backup 6.0. - Restore by Mail hard drives that are twice the size - up to 8TB. - The ability to archive data directly to Backblaze B2 Cloud Storage. - Up to 50% faster backups. - Create your own network blocklist to help avoid data caps. - More efficient and performant Mac and Windows applications. - Mobile enhancements for iOS and Android. We'll walk you through many of these features such as archiving to B2 and explain how they can be helpful to you. •Take a look at the SMART stats we are collecting and what they are telling us. Do you have content archived on LTO-5 or LTO-6 tape? If so, what’s your plan for migrating it before it’s too late? LTO-8 is available now, and manufacturers only guarantee at most two generations of backward compatibility. That is, presuming the tape doesn’t fail first. With the right strategy, modernizing your archive by migrating from LTO to the cloud doesn’t have to be painful or time-consuming. A great media archiving solution gives you peace of mind knowing that your content is securely stored, and can easily scale to any size you need while easing the pressure on your local storage. And, ideally your users can use it themselves. This webinar will show you a demo of the three steps it takes to install and configure a media archiving solution using Archiware and Backblaze. You’ll see how your media archive transforms from files and folders on a server to a web-based, searchable and previewable catalog that can be used by everyone on your team. Do you have terabytes of video sitting in a Backblaze B2 bucket, or project files and content trapped on USB hard drives in the closet, waiting to upload it to B2? Cantemo’s newest iconik cloud-based asset management service is here - and works seamlessly with Backblaze B2. iconik allows your media files stored in B2 to come alive, for less than $100/user/month. In this webinar you’ll see a demo of the three simple steps to get up and running with iconik and Backblaze B2. You’ll see how your content can be easily searched, filtered, sorted and previewed all from a web browser, from anywhere. Also, we will show how AI is used for automatic metadata creation and how this all works with editing tools like Adobe Premiere. David Gugick, CloudBerry Lab and Andy Klein, Backblaze. It has been over a year since the ransomware attack known as Wanna Cry first struck fear into businesses, organizations, and individuals around the globe. While ransomware attacks have leveled off since then, it is only a matter of time before the next wave of ransomware takes advantage of an obscure or newly found vulnerability. One prediction suggests that there will be a ransomware attack on businesses every 14 seconds by the end of 2019. But, ransomware is only effective if regular backups are not kept. Join CloudBerry Lab and Backblaze as they show you how easy it can be to protect your data and your organization from falling victim to the next wave of ransomware. Creating today’s media requires a media asset management (MAM) system to be flexible enough to handle projects ranging from small in-house efforts to those requiring a global workforce. Traditional (MAM) systems that utilize on-premise server and LTO based media assets are often slow and inflexible when faced with a global cloud-based workforce. The result - costs rise, margins shrink, and deadlines are missed. Join Cat DV and Backblaze as they walk you through the details on how you can have on-premise to cloud-based media workflows that cost effectively deliver the flexibility you need to work locally or globally. CatDV has provided its pioneering media asset management suite to creative and business teams since 2003. Backblaze B2 is affordable, high performance, cloud storage used by thousands of organizations around the globe. Are you using tape jobs in Veeam? Backblaze B2 has supplanted LTO as the least expensive storage to archive your Veeam backups. Backblaze B2 is now being adopted by many customers who are choosing to abandon LTO. Aside from saving money and eliminating on-premise tape infrastructure, this backup strategy allows you to automatically practice a 3-2-1 backup strategy and quickly recover VMs in the cloud, too. Join this webinar to see how Starwind’s Storage Gateway of Backblaze B2 allows you to continue using your current Veeam tape jobs with B2 without changing any Veeam processes! Any organization that creates rich media under tight deadlines and budget constraints knows the pain of losing data. Learn how using eMam and B2 together can help you avoid losing access to your valuable media through misplacement, accident, or hard drive failure. Backblaze B2 provides a permanent, secure, low-cost cloud archive that can grow with your needs. The eMAM media asset management system can work locally or in the cloud to provide you with proxy copies to search, find, use, and share your media. With the combined solution, you can manage your media from anywhere with any connected device, delivering it however and wherever it may be needed. You can save money on expensive storage systems and time lost in finding or reshooting media. Rest assured, your media will always be protected and accessible with an eMAM managed Backblaze B2 archive. The webinar will be 30 minutes followed by 15 minutes of Q&A. KLRU-TV, Austin PBS created Austin City Limits 43 years ago and has produced it ever since. Join us as we interview James Cole of KLRU-TV as he gives us an insider’s look at the process they used, and the challenges they faced, in preserving the Austin City Limits catalog for future generations. James will tell us how they were able to capture and restore over 4,000 hours of aging videotape, combine it with their existing digital library, and preserve their one-of-a-kind content using the B2 Fireball and B2 Cloud Storage. Spending too much money and time on computer backup for your company? Join us to see how you can get automatic, unlimited data backup for just $50/year per Mac or PC client. Learn how easy it is to manage your backups with our flexible administrative console. With our Group Management functionality you can map your backups to your organizational needs. In addition, you will see how easy it is to back up and store data for Windows servers, Linux servers, or NAS devices for just $5/TB/month. Sign up today to learn more. It’s time for our 2017 Hard Drive Stats year-in-review. This past year we added 10TB and 12TB drives to our cache of nearly 100,000 hard drives. This gives us over 500 petabytes of customer data under management. We’ll start with looking at the failure rates of all of the drives we’ve used since we started keeping the stats in 2013. Then we’ll cover 2017 and look for trends over the years. We’ll finish up by comparing the failure rates of our 8 TB consumer drives and our 8 TB enterprise drives. Join us. Join us to see how Managed Services Providers have turned customer backup into a profitable and growing business. If your current backup solution is hard to set-up, a pain to manage, and has unpredictable storage costs, then you’re in the right place. The CloudBerry Managed Backup Service combined with Backblaze B2 Cloud Storage delivers an easy to use, secure, and amazingly inexpensive comprehensive backup solution you can provide for your customers. Synology NAS devices offer a centralized backup solution for data stored on the PC and Mac computers in your home or office. With files being backed up to your local Synology NAS in real-time, you can add an off-site component to your backup strategy by then automatically uploading files to BackBlaze's B2 Cloud Storage using Synology's Cloud Sync application. We’ll show you how to combine Synology's backup applications with BackBlaze B2 to get a complete, automatic, and economical backup solution for all your computers, workstations and servers. Backblaze manages over 85,000 hard drives and stores over 400 petabytes of customer data. In this webinar we'll share the reliability of the hard drives we use. We'll cover the annualized failure rates of the Seagate, WDC and HGST hard drives in our data centers, varying in size from 3 TB to 12 TB. We'll also compare Enterprise versus Consumer hard drive models, to see which is the best for you. CrashPlan for Home users were recently notified that their backup service is closing down. Users are being forced to migrate their data to another cloud backup provider or to CrashPlan’s Small Business offering which is nearly twice as expensive. In this webinar we’ll identify the issues in migrating your data and provide an overview of how to avoid losing data during the process. For example, what will happen to the files you have archived in CrashPlan that are not on your computer when you migrate? Join Paul Tien, CEO and Founder of Morro Data (previously the founder of ReadyNAS – acquired by Netgear) as he discusses how combining the ubiquity of the cloud with the performance and local network server access of the NAS is the next evolution of storage. The Morro Data CloudNAS in combination with Backblaze B2, is a plug and play solution which allows prosumers, small office/home office power users, and small- and medium-sized businesses to move their primary file server to the cloud while keeping the local gigabit performance of their on-premise NAS solution. For nearly 10 years Backblaze has been a transparent company in the opaque world of cloud data storage. We've written on our blog about hard drive failure rates, data center internals, our open source high density storage design, and more. Here we are on Brighttalk and each month our goal is to bring you a webcast or video that sheds some light behind the scenes of a Cloud Storage company. And yes, we'll have a sales pitch or two the "off" weeks. Join us when you can!